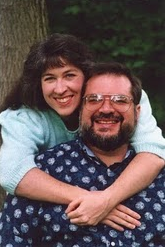 "My husband Dave was a children's pastor until the summer of 2000 when an undiagnosed illness left him unable to think clearly, remember names and job duties, or hold regular conversations. He had tremors in his arms and legs, and pain in joints and muscles. Sensitivities to light, sound, motion, chemicals, molds, and even cooking smells caused dizziness, headaches, or blackouts. "We had been to thirteen doctors in three years. I combed the Internet, researching everything from Chemical Sensitivities to Mad Cow Disease, while raising our toddler and preschooler." This is the story of Merry Marinello's journey with her husband and children through debilitating illness. This was not the life she thought she would have. This was not the life she wanted. But it was the life God was giving her. How would she respond? 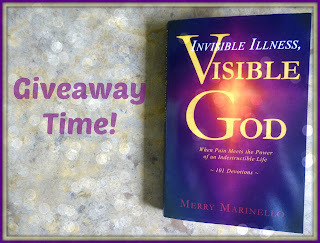 In her book, Invisible Illness, Visible God Merry writes 101 devotions, walking the reader along her path with her. She doesn't give cliché answers to deep faith questions, instead she honestly shares her frustrations, doubts, and lessons she is learning. Merry's transparency as she talks about her struggles and faith, and her courage to tackle hard questions like, "How can I love One who makes me bitter?" are an encouragement to all who have ever doubted God in the midst of trials. With liberal use of Bible passages, Merry inspires her readers in their own ongoing problems with illness, pain, or other long term trials. Along her journey, Merry discovered that many of her negative thoughts were subtle lies about God's character or His views of her which she didn't even recognize until she compared them to scripture. In the first appendix, Merry has a list of twenty-one lies that scripture can refute. She has a second appendix with reminders to care givers to take care of themselves as well. Remember how I said that your own devotions will help you "get to the table" for a meal with your family? This book may be the one you need for the next three-plus months to help you give your burden to God and learn to hope and trust in Him. 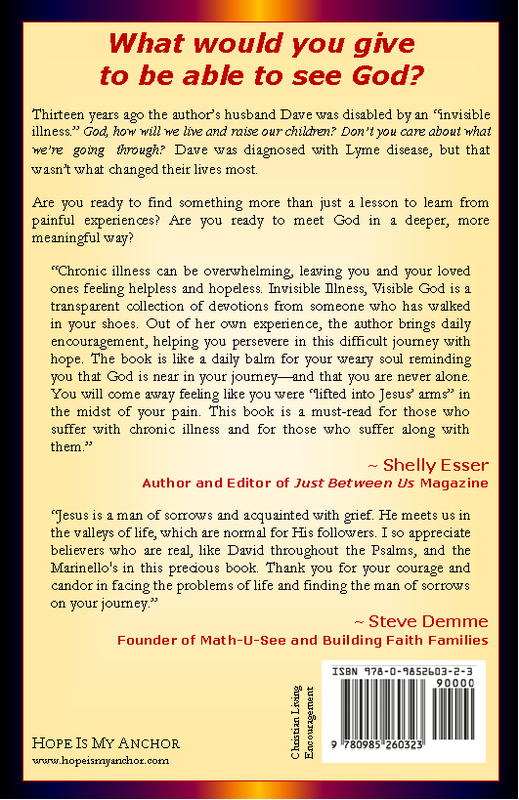 I'm planning to give away a copy of this (see below for giveaway details), but if you can't wait, or have a friend (or several) who you know need spiritual refreshment in the midst of their struggles, to order a copy, go to www.hopeismyanchor.com. Would you like to win a copy of Merry's book for yourself or a friend? Then write a comment to me below or on my Facebook page telling me that you would like this book and you will be entered in the giveaway. (I would appreciate it if you would also become a follower of this blog and/or "like" my Facebook page.) (You must have a U.S. mailing address I can where I can send the book to qualify.) I will hold the giveaway Monday evening, July 1 by random drawing and announce the winner on Facebook and in this blog next Tuesday, July 2. Disclosure: I was given a copy of this book to review, but not paid in any way to make positive comments about it. Sounds like a great book that is much needed in this day of disappointments and trials. GOD IS LOVE, regardless of whether 'we feel' HE is working in the way we would 'like' HIM to. 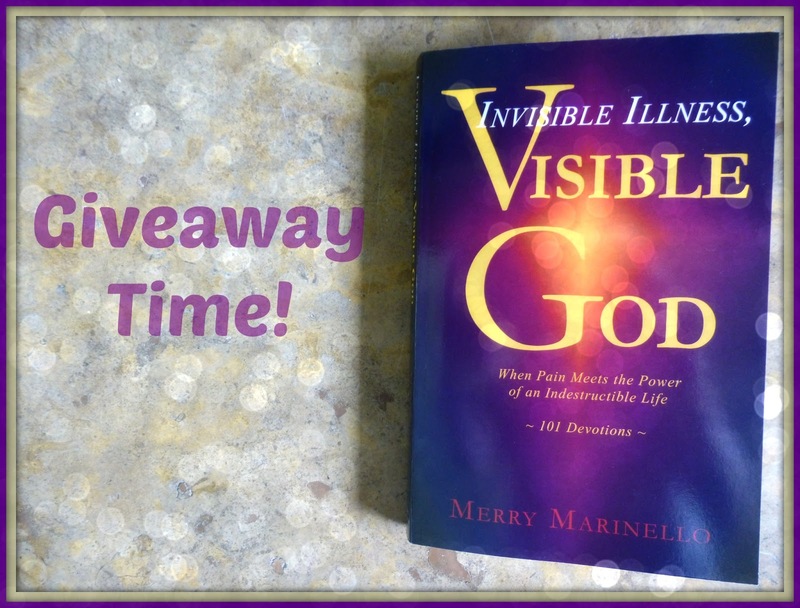 I too have an invisible illness... this book sounds like such an encouragement! Glad to find you through TWW's linkup today! Glad you found me, too, Elisabeth! Merry is a treasure and I would love to be encouraged by her journey! I know Merry from a board I'm on. She has always been a blessing. I'd love an opportunity to win her book. While I haven't been diagnosed I do deal with chronic pain which I think is contributed to due to stress (my oldest just happens to have Down Syndrome, OCD, ADD and Autistic tendencies). I know Merry from online, also. She is a warm and wonderful friend! <3 Of course I'd love to win a copy! Our third child suffers from "failure to thrive" and is still 43 lbs. at the age of twelve. While it is miraculous that he has made it this long, his life (and ours) will never be what the world considers "normal." Praying for healing, (while realizing healing may not come until heaven) and suffering from the judgments of others who have not walked in our shoes have been only a few of the things God has used to shape us. I would be very interested in winning a copy of Merry's book and reading about their journey through a similar valley of no answers. It would be great to win a copy of this book! My husband is in this situation now for over 20 years. It's difficult as the spouse to go through his ups and downs, etc. Oh, an invisible illness must be frustrating. Hope that you will get it all figured out. Hi Merry, I would love to have a copy of your book. Thank you. Having lived with several "invisible" illnesses, I can totally relate. I would love to win a copy of this book! Thanks for sharing. I would love to give a copy of this book to my mom. She has suffered with Crohn's Disease for almost 40 years and has developed Kidney Disease and gone on Dialysis over the past 3 years. One time her pastor told her, "You're too pretty to be sick!" People just don't understand how she hurts and suffers because of her need to hide her symptoms. Anyway, I've tried to walk with her through her Spiritual journey to grow closer to God during her trials, but she's only able to listen when she's feeling healthy. I feel this book would help her when she's not healthy. My favorite kind of giveaway...a book! Invisible Illness, Visible God sounds like an excellent reminder of God's faithfulness in our lives in the midst of difficulties. Sounds like an excellent reminder of God's faithfulness in the midst of difficulties. Thanks for sharing this post, Sharon!! Merry and I now work for the same company! And when we met in person in May we also discovered that we lived at International Teams with His Mansion at the same time she was working there!! Small world! It sounds like her book is a must read!! I also have an"invisible illness" that has taken five years from me. I greatly look forward to reading Merry's book to help remind me God is with me every step of the way every day. 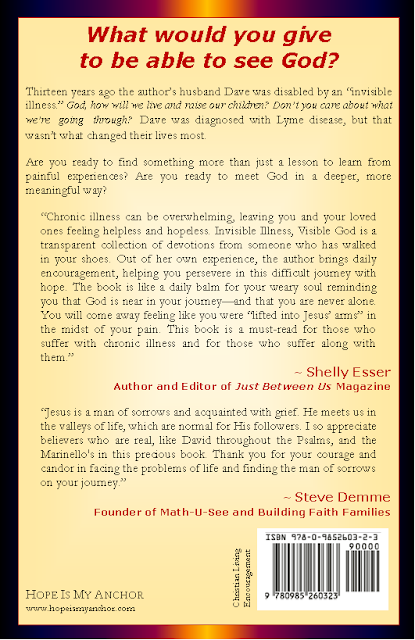 Alicia F.
Sounds like a wonderful testimony and an encouraging book to read. Thanks for sharing this over at WholeHearted Home last week. 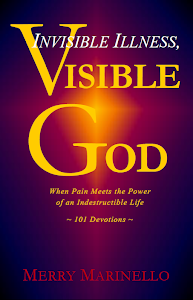 Hi Sharon--thought you might like to know that Invisible Illness, Visible God won an award! http://www.hopeismyanchor.com/2014/01/illumination-award-winner-invisible.html Hope you are doing well. 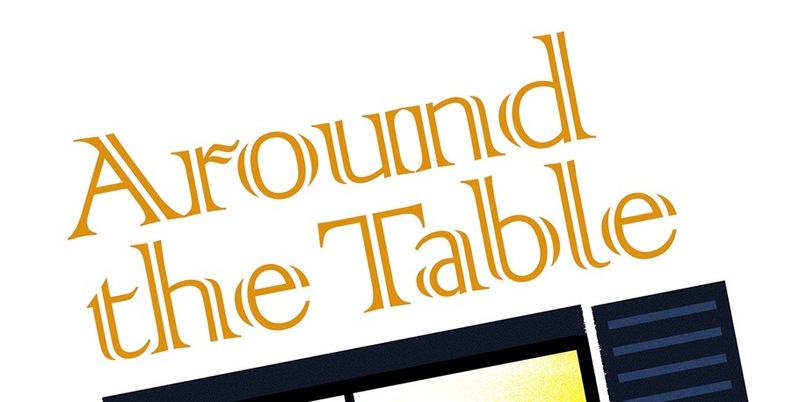 Your Table: An Attractive "Meal Zone"
There. Is. No. Need. To. Yell.